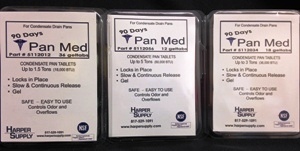 Home > Catalog > HVAC, Residential, Speciality > Pan Med Jr.
Pan Med Jr geltabs are formulated with AT-8, the new technology breakthrough for treating A/C drain lines and pans. Easy to use-use place a Pan Med Jr in the pan and as moisture drips on or flows over the geltab, it activates the chemicals that lock the Pan-Med in place. Once the Pan-Med locks into place, they will never move and block the drain line. Pan Med Jr then forms a gel that slowly releases the active ingredients, producing up to 6 months of safe, positives prolong cleaning action.